BinketGroup is today one of the largest specialised factories in the internal doors sector of the whole of Central Asia. The high level of automation of the production process, that exceeds the initial target of 700 doors per day, is the result of the partnership with SCM. In a handful of years the Rimini-based company has supplied over eighty different technologies and a fully-comprehensive support project. In March 2016 the construction of one of the largest factories of the entire Central Asian region for internal doors began by BinketGroup, in the Sergelijsk region of Tashkent, in Uzbekistan. In an area of 8 hectares the production capacity covers 20,000 square metres. The objective of this ambitious project was to apply Italian technologies, unique in their genre, to the production of high quality internal doors, with an internationally appreciated refined design. Comfort and welcome are the mission of this company that provides a custom design service for interiors of homes and offices, and uses only reliable raw materials, as well as components and decorative materials, from the most trustworthy global suppliers. An innovative factory. The meeting with SCM, one of the protagonists of the global market of advanced industrial woodworking technologies, and the solid and profitable partnership that followed, allowed the ideas to be turned into facts. The result was the creation of a concrete project for an innovative turnkey factory, with a high level production both in terms of the final product and in the machining process.The automation is at the highest levels: from supplying materials to the area, to the packaging of panels in heat-shrinkage film and corrugated cardboard. The storage of the finished products in the warehouses ready for delivery, ensures the optimal organisation of the production. As an added value there is a 9,000 square metre warehouse that resolves any logistical issues.Moreover, the company is able to provide an after-sale service, such as the installation of doors, that provides customers with considerable time savings. The involvement of over 300 specialists (national experts and key employees invited from different countries such as Ukraine, Belarus, Russia and Italy) is the umpteenth strength of the company, that ensures the high quality levels of the product. “2018 is a particularly important landmark year for the development of our company, because we will present and launch the «PorteMio» and «Dorro» internal doors on the retail market of Uzbekistan and nearby countries”. The «PorteMio» collection of doors will consist of classic and hi-tech models. The design of the «PorteMio» doors highlights the simplicity of the lines, the perfection of the proportions and the refinement of the patterns. The doors are designed for residential homes and offices. The «Dorro» collection of doors is, on the other hand, designed for more practical customers, that appreciate quality and service. The collection contains the most popular design solutions for residential buildings, with natural and soft hues, in classic and modern designs. With the launch of the mass-produced doors, buyers will no longer have to order them individually and wait for the long production times. Everything will become simpler: after choosing the model, it will be available within 24 hours. Moreover in 2018 the company will complete the next significant project for organising the furniture production. The use of advanced technologies, and the improved production organisation, significantly increase productivity. The initial target of 700 doors per day, was exceeded thanks to the new plant designed by SCM, which also contributed to reducing production costs and improving the quality of the service, including the after-sales maintenance. But the technological progress also allowed the possibility of performing custom machining operations to the product, such as, for example, decorations on the glass and special finishes. SCM, through the Engineering staff, has supplied over 80 different technologies, with the machines that, working together, could guarantee the entire production process. The flow had to be organised for the production of doors and jambs. 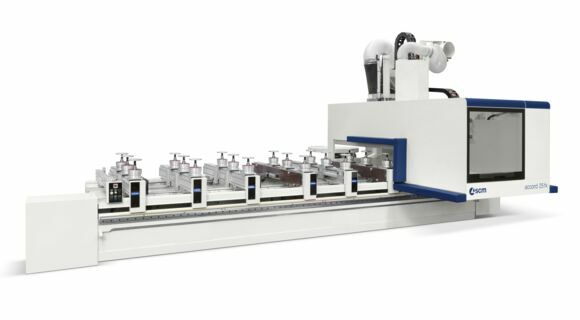 For the former the process starts with the panel sizing and pressing, continues with the edge-banding and then is followed by the special processes, with an accord machining centre. 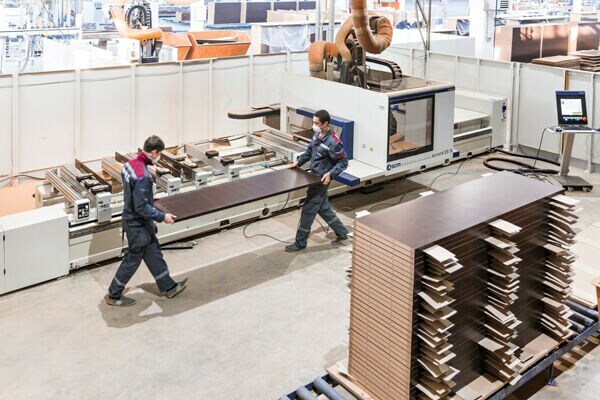 The jambs start with the panel sizing stage, followed by cutting the unfinished MDF strips, with a superset spindle moulder, followed by the coating and the drilling and routing. The production cycle continues with the assembly and packing of the finished product, that then reaches the warehouse. Considering the considerable quantity of equipment supplied, SCM’s true ability has been to design the whole production cycle necessary to start the factory upstream, with a huge logistical undertaking that involved a large number of suppliers, both inside SCM and third party. The close collaboration with the SCM Logistical Office to manage the transport of the machines, was fundamental throughout the process: over 80 trucks set off from Italy. The SCM service consisted of various stages. The first was focused on guaranteeing a first group of technologies to start an initial standard production line. 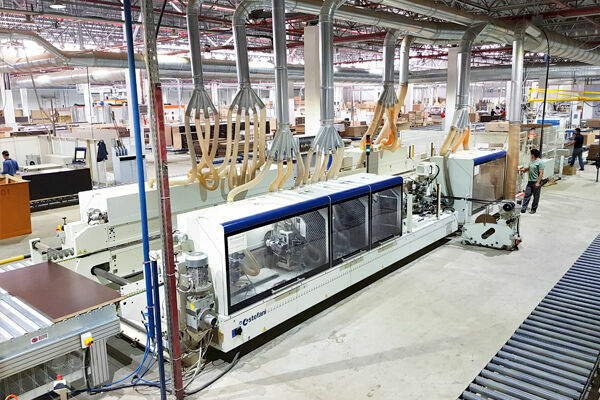 The second consisted in adding other machines and machining centres, necessary for the more refined and complex machining operations, such as painting, in order to achieve a more customised product. The third stage was completed a few months ago with the delivery of the latest technologies, such as CMS machines, part of the SCM Group, used to cut glass. “We chose SCM for numerous reasons”, they explain from the company. “Its long experience in the sector, the considerable reliability, quality and availability of its equipment, the excellent ratio between price, functionality and quality and the staff, who are capable of providing excellent and thorough advice, during the purchasing stage and afterwards. SCM was able to understand our specific objectives and help us increase our production further”.